Ahh Grantham, a place where I had never been in my life, I’d been through it on the train but never had anything else to do with Grantham. City were playing them in a pre-season friendly so I decided to make the short trip down the road and had virtually no clue of what to expect. I’d seen clips of them playing Orient 2 seasons ago in the FA Cup, but that didn’t give a good enough picture of what the ground was like. So after a short trip down the road, we ended up coming up to the ground and I must say, I was actually fairly impressed despite of the £8 admission fee which for not only a friendly, but a non-league side was ridiculous, made even stupider by seeing a sign to renew season tickets for £144. Just ridiculous. So we got inside the ground and found out seat in the upper section of the main stand and I must say, I was actually quite impressed. The seating section was extremely comfortable with a LOT of leg room and an excellent view of the action. The seating section held around 400-500 people and was elevated about a smaller piece of seating. 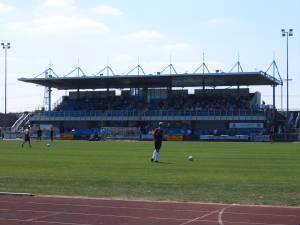 The other stand was the other side of the pitch and was a terrace that was actually bigger (height wise) than the terracing located at Cheltenham, Torquay or Yeovil. 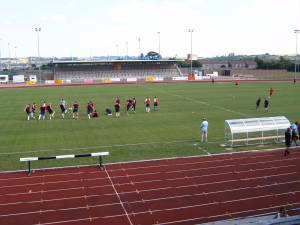 The only problem with Grantham’s ground really is that it’s also an athletics’ stadium meaning there’s a running track on the outside which means the action seems a bit far away. Also, the only place that sells food in the whole ground is near the terraced stand, meaning that if you’re in the seating, you have to walk around the barriers around the race track. Overall, Grantham is a fairly nice ground considering what level it’s at but it’s obvious that it’s not meant for football. Unfortunatly really and maybe with a little redevelopment, this wouldn’t look too out of place in the league, funnily enough, it’s better than some grounds that are actually in the league although in the interest of fairness, I won’t say who’s grounds.